C-4 is a widely used family of plastic explosives. It is composed of explosives, plastic binder, plasticizers and sometimes a marker taggant chemical. The explosive compound in C-4 is RDX, which makes up around 91% of C-4 by mass. The plasticizer is diethylhexyl or dioctyl sebacate and the binder is usually polyisobutylene. Another plasticizer used is dioctyl adipate (DOA). A small amount of SAE 10 non-detergent motor oil is also added. C-4 material is an off-white solid with a texture similar to modeling clay. In view of possible use of C-4 and other related type of plastic explosives (such as PE4 and Semtex) by terrorists there is an important need to have an improved method and instruments for the C-4 source identification. The various C-4 explosives can be correlated to their source in a few ways including: a) Main explosive type such as RDX with or without few percents of co-produced HMX; b) The type of taggant compound added; c) Plasticizer used; d) Oil used and its composition. However, taggant compounds are not always found, particularly in terrorist used C-4, HMX is not always found (co-produced) and while oil characterization is possible, its characterization via isomer abundance analysis although possible with Cold EI it is not sensitive enough in view of the large variety of compounds in the oil and its small concentration. Thus, we selected C-4 characterization via its plasticizers types, their isomer distributions, homologous compounds and major plasticizer related impurities. While for effective C-4 source identification one needs to build a library of C-4 explosives mass chromatograms our goal is to demonstrate the effectiveness of C-4 source characterization method via its plasticizers analysis by the 5975-SMB GC-MS with Cold EI. Keep reading to find out how the 5975-SMB GC-MS with Cold EI helps in C-4 source characterization for its identification via the fingerprinting of its plasticizers type, isomers and homologous compounds. Two samples of C4 were received with code names A and B with the goal to try to differentiate them from each other and uniquely characterize them via their plasticizers. The samples were dissolved in acetone at about 0.2% and injected splitless into the column. Small white stuff remained undissolved, possibly of the polymer in the C-4. Alternatively, these samples were also dissolved in hexane and after most of the explosive compound RDX precipitated the supernatant solutions of hexane with dissolved plasticizers and oil were injected as below. System: Aviv Analytical 5975-SMB GC-MS with Cold EI system that is based on the combination of an Agilent 5975 MSD with the Aviv Analytical supersonic molecular beam interface and its unique fly-through ion source (GC-MS with Cold EI). Injector: 250ºC injector temperature with Pulsed Splitless or Split injection at 30 PSIG. Split ratio: Splitless for the samples in acetone and split 4:1 for the samples in hexane. On column amount: unknown but estimated at around 50 ng plasticizers on-column. GC Oven: 80ºC followed by 20ºC/min to 300C and wait 1 min for total of 12 min. He column flow rate: 5 ml/min with flow program after 8 minutes to 12 ml/min at 7 ml/min.min. SMB source: 12 mA emission, 700 mBar nozzle backing pressure, 60 ml/min total He flow rate (column plus make up at 250C transfer line temperature). SMB transferline temperature: 250ºC with temperature program of 10ºC/min after 7 min to 280ºC. Mass Spectral range: 50-700 amu at 2 Hz scan rate. 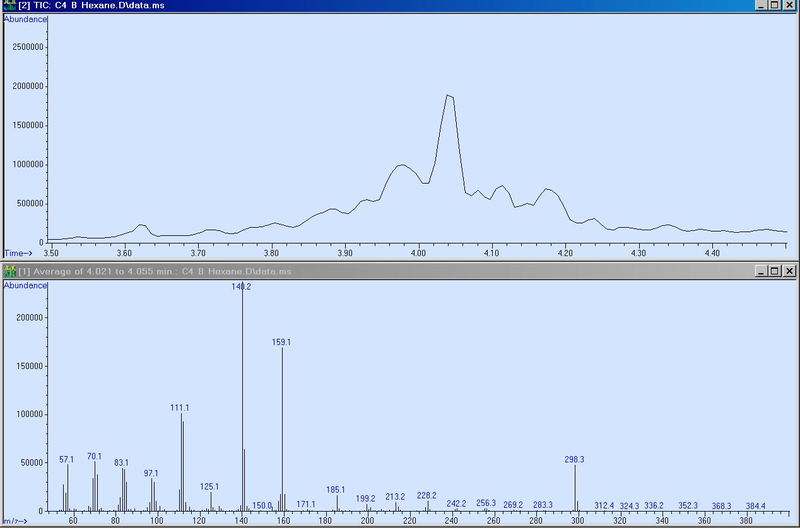 In figure 1 we show the total ion count mass chromatograms of two C-4 explosive samples code names A and B (left traces) and the Cold EI mass spectra of the arrows indicated plasticizer peaks (right traces). Note the availability of enhanced molecular ions in the Cold EI MS which are very weak or absent in standard EI, and the major TIC differences in the plasticizer elution time window. Figure 1 was obtained with acetone dissolved samples that included the RDX. As demonstrated, in the elution time window of the plasticizers they dominate the TIC mass chromatograms and the differences in the TIC are visible and are immediately clear. The plasticizers are dioctyl sebacate (m/z=426.4) and dioctyl adipate (m/z=370.4) in their few isomer and homologous compound forms. Three isomers of the dioctyl adipate are observed (the two weak isomers are indicated by the small arrows) and while the dioctyl sebacate exhibits one isomer it also shows at list two additional higher mass homologous compounds with m/z=440.4 and 454.4 that add to its characterization (indicated by the small arrows in the sample C-4 B TIC). Figure 1. 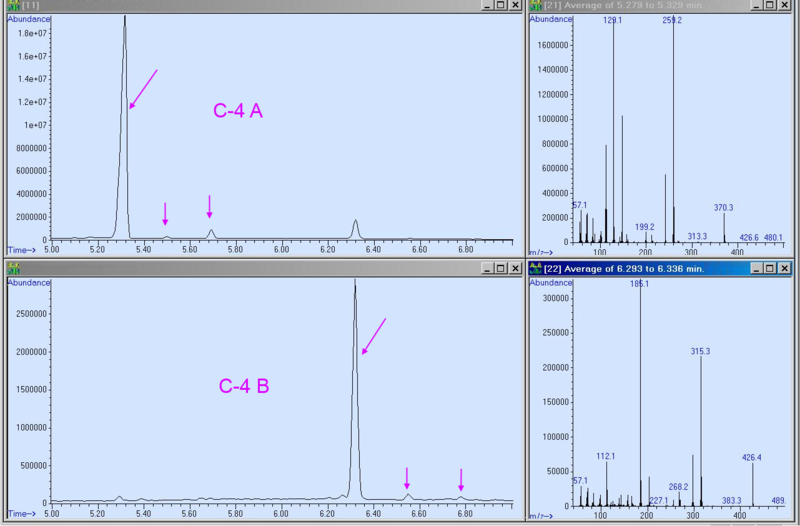 Total ion count mass chromatograms of C-4 explosives code names A and B and the Cold EI mass spectra of the indicated main plasticizer peaks. Note the availability of enhanced molecular ions which is very weak or absent in standard EI and the major TIC differences in the plasticizer elution time window. While the C-4 samples A includes mostly dioctyl adipate plasticizer in the form of three isomers in a unique isomer distribution pattern plus a little bit of dioctyl sebacate, sample B includes dioctyl sebacate in a single isomer form. However, it also includes two additional peaks of its homologous compounds. In Figure 2 we show the reconstructed single ion monitoring mass chromatograms (RSIM) of this C-4 explosives code name B on m/z=426.4 of dioctyl sebacate and m/z=440.4 and m/z=454.5 of its homologous compounds with the addition of CH2 and C2H4. These RSIM traces are made possible via the enhanced molecular ion in Cold EI and as demonstrated the second homologous compound further exhibits its own isomer distribution pattern. Note that the second homologous compound is at about 1% of the dioctyl sebacate. In addition, C-4 sample B further uniquely includes a few isomers of nonyl decanoate C19H38O2 as demonstrated in Figure 3. Thus, as shown, we found that the plasticizers of C-4 explosives provide a clear and unambiguous characterization of the C-4 source origin if a library of C-4 mass chromatograms would be constructed for comparison. Figure 2. Reconstructed single ion mass chromatograms (RSIM) of C-4 explosives code name B on m/z=426.4 of dioctyl sebacate and m/z=440.4 and m/z=454.5 of its homologous compounds with the addition of CH2 and C2H4. These RSIM traces are made possible via the enhanced molecular ions in Cold EI and the second homologous compound further exhibits isomeric structure. Figure 3. 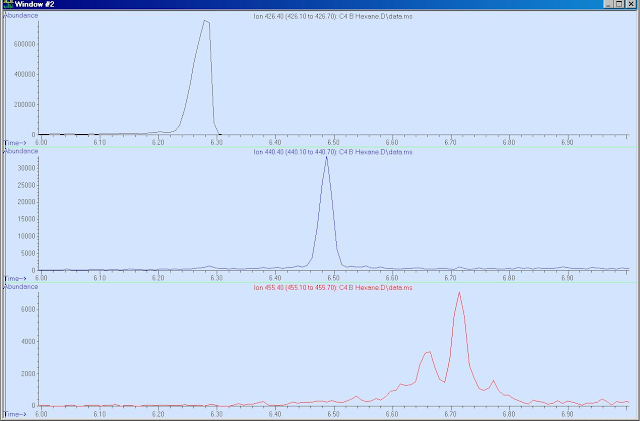 Total ion count (TIC) mass chromatogram of the C-4 sample B at the 3.5-4.5 elution time window, and the obtained Cold EI mass spectrum of the biggest TIC peak. 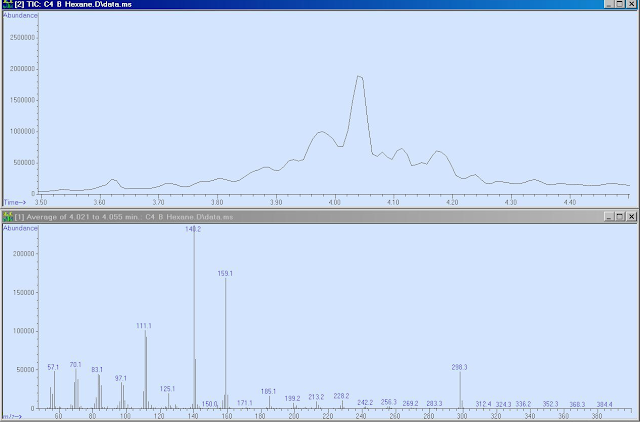 The mass spectrum was identified as nonyl decanoate C19H38O2 and the few peaks around it are of its various isomers. We demonstrated that the 5975-SMB GC-MS with Cold EI can effectively serve for C-4 explosives characterization for its source identification via the analysis of its plasticizers, their isomers, homologous compounds and plasticizers related impurities. Cold EI MS provides enhanced molecular ions that are abundant for all the plasticizers, in contrast to standard EI. Molecular ions are by far the most selective ions in the mass spectra thus they can effectively serve for C-4 residue identification at trace level in complex matrices. While not tested yet, this method could potentially also serve for post-blast C-4 analysis via its plasticizers. The 5975-SMB GC-MS with Cold EI is characterized by improved sensitivity for the plasticizers with estimated femtogram level LOD at SIM mode. The demonstrated analysis time is about 3 times faster than with standard GC-MS and if essential it can be further reduced. Admittedly, this method of C-4 source identification can be attempted by standard GC-MS but the 5975-SMB GC-MS with Cold EI excels in it in view of its provision of largely enhanced molecular ions and superior sensitivity. Clearly more samples need to be analyzed in order to substantiate this approach.